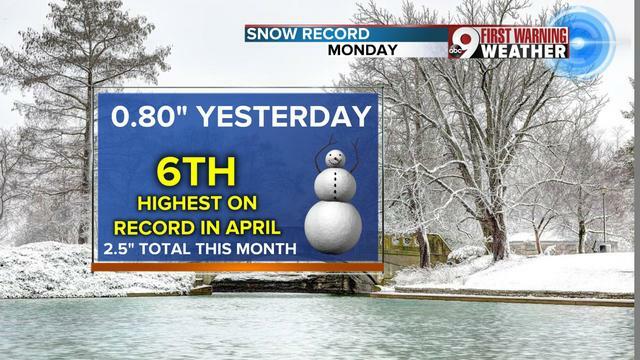 Seeing light snow in April isn't unusual, but several days of flurries this month have landed the Queen City a tie for the sixth snowiest April on record. As of Tuesday, Cincinnati has picked up 2.5" of snow so far this month, which is 2.1" above normal. Thankfully all of this snow has all come down in minor events. Generally, the snow melted on the roads and just accumulated on elevated surfaces. With two records set, I had to look at the records for the entire month to see where we stand for April. The snowiest April on record was back in 1920 when 5.2 inches of snow fell in the month. That's more than double what we've seen so far this April. The other years that we saw higher amounts of snow include 1916, 1953, 1977 and 1992.